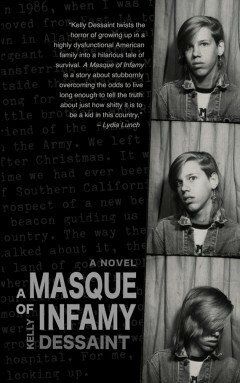 A Masque of Infamy is a ribald story of teenage rebellion, punk rock and survival. After moving from Los Angeles to small town Alabama in 1987, Louis Baudrey tries to fit in at the local high school, but the Bible-thumpers and the rednecks don’t take too kindly to his outlandish wardrobe and punk attitude. At home, he defies the sadistic intentions of Rick, his father’s friend, who tries to rule the household with an iron fist. As Louis is about to be shipped off to military school, he stumbles upon indisputable proof that will free him and his younger brother from Rick’s tyranny. But just when he thinks their troubles are over, they’re locked up in the adolescent ward of a mental hospital, where Louis must fight the red tape of the system to save himself, his brother and maybe even his dream of being a punk rocker.